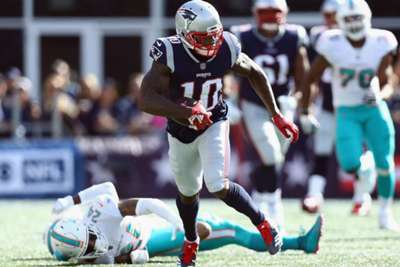 Julian Edelman believes Josh Gordon will be a major contributor for the New England Patriots. New England acquired Gordon from the Cleveland Browns in exchange for a late-round draft choice in September and he caught his first touchdown pass with the team in their week-five win over the Indianapolis Colts. Edelman said Gordon has been a "great team-mate". "Dude works hard," Edelman told ESPN. "I really think he can be a really big piece of us. "It's exciting to be around him. He loves football, you can tell. He knows his stuff. It's getting more and more fun the more he knows." In total, Gordon has caught four passes for 82 yards and the score in two games with New England. Edelman returned from a four-game suspension for violating the NFL's policy on performance-enhancing substances in the victory over Indianapolis. He caught seven passes for 57 yards in the game. The Patriots will face the undefeated Kansas City Chiefs in week six on Sunday.